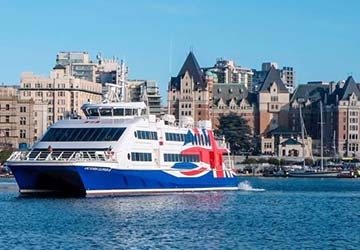 Clipper Vacation’s Victoria Clipper V vessel can carry up to 440 passengers on each crossing between Seattle, USA and Victoria, Canada. The ferry has a waterjet propulsion system that helps reach impressive speeds of up to 35 knots, one of the fastest passenger vessels in the Western Hemisphere. On board you’ll find an upper deck complete with a Comfort Class Cabin area, decked out in leather seating and with complimentary snacks and drinks. The outside deck area is open to all travellers and there is also duty free alcohol as well as a gift shop for souvenirs and clothing. Please Note: Whilst we have taken great care in making our Victoria Clipper V guide as accurate as possible, onboard facilities, services and entertainment may vary depending on the date and time of year that you travel, facilities mentioned may change without notification and ferry companies reserve the right to operate vessels other than those mentioned at time of booking without prior notification.